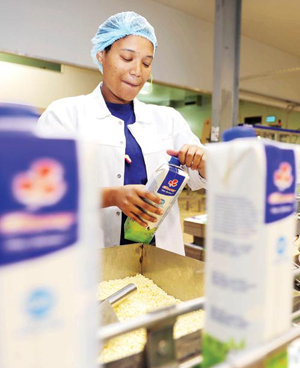 Johannesburg - Dairy and beverages maker Clover [JSE:CLR] reported a slight rise in full-year earnings on Tuesday, lifted by higher selling prices, and said it plans to launch new products and enter new markets to boost growth. Clover, whose brands include Tropika juices, said diluted headline earnings per share for the year to end-June totalled 111.5 cents from 108.7 cents a year earlier. Headline earnings are the main profit gauge in South Africa and exclude certain one-off items. Clover said it expects solid results ahead as it develops new products and reaps benefits of its expansion projects. The company is currently finalising its Cielo Blu project, which involves moving production facilities closer to milk sources in the coastal areas of South Africa. It is also looking at venturing into markets outside South Africa. Chief Executive Johann Vorster said the company was eyeing countries close to South Africa, such as Botswana, Lesotho and Namibia. "We are also actively looking at Mozambique, Angola and Nigeria," Vorster told Reuters. "It's key to have your own production facilities or some control of your production facilities in these countries. We are at the infant stages of our Africa expansion project." Clover declared a final gross dividend of 22 cents.